I invented a new dance and you do it with your mouth its called the Agnolotti. I'm telling you that my taste buds are doing the cha-cha right now and thats no joke. My tongue is tickled all the way to my ears. Buitoni Wild Mushroom Agnolotti is serious business. I could eat this stuff right from the package. I have been toiling over what to do for days now and then I said "forget it I will look around and see what I have on hand." I made some sundried tomatoes and packed them in a jar of olive oil, I had done the same with some dried wild mushrooms I found last fall and they too were soaking in olive oil. I had some half and half in the fridge so a sauce was born. I sauteed the dried tomatoes and dried mushrooms in a little of their own oil and some butter to soften them up a bit. Once the tomatoes and mushrooms were adequately soft I added in a little of the cream and simmered gently for a minute. I poured this over the boiled pasta and threw a few thyme leaves on at the last minute because if you know - wild mushrooms taste really good with thyme - regular mushrooms taste really good with thyme - mushroom pasta must taste really good with thyme! I could not eat this fast enough to keep up with the samba in my mouth. Con todo, thats all the spanish you need to know when you go to the taco trucks in Jackson Heights, Queens. 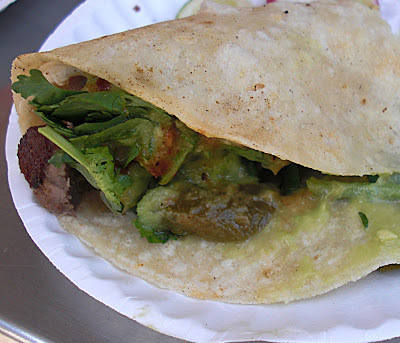 All the tacos are two bucks and 'con todo' which means 'with everything' includes guacamole, onions and cilantro; you can add additional hot sauce either red or green or both and there are little tubs of sliced radish and jalapeno for nibbling on the side. 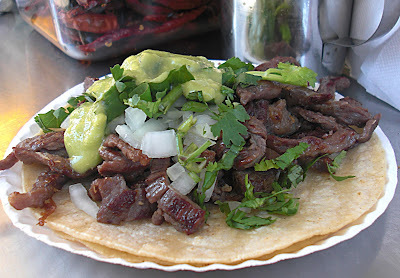 I get carnitas, which is like pulled pork, lengua, which is tongue and cecina, which is salty beef and a soda. Seven bucks later I am stuffed to the gills. I found mushrooms yesterday. Shaggy Manes. I love the texture and I love the flavor but these react to beer and I drink beer. There are several in the inky cap variety that are edible but they do react to alcohol - you cant eat them and drink - they will make you sick. I gave them to my friend. Since we caught so many fish we didnt know what to do with it signaled a time for chicken. Its not like we dont eat chicken enough because we do and its not like we dont want to eat chicken either because we do. We did make some spicy shrimp and mussels after our beach day but we were all too cranky and too hungry and too tired to make a 'picture'out of it so you have to take my word for it. I do have a picture of the shrimp, just to prove it, but the mussels were gobbled up so fast and displayed in a vat so unnattractive it looked like a bucket of seafood, not like this skillet full of buttery spicy shrimp. So if this looks better than the mussels imagine how they must've looked. Broiled chicken with stuffed zucchini. Why use a spoon when you can use a gadget. Why use a gadget and try and take a picture when you need two hands to scoop out the pulp and at least one hand to take a picture - why because of the love and passion I feel for this stuff thats why! Simple roasted chicken served simply with a baked stuffed zucchini, or a zucchini relleno if you want to act all fusion like; you can pour the deglazed pan juices mounted with butter over it if you want to oompf it up a bit, I did. Seriously though, as long as it tastes good -right? I am so dang anxious for the mushroom season to begin it isnt even funny. Finally, I got around to this and I am glad I did. 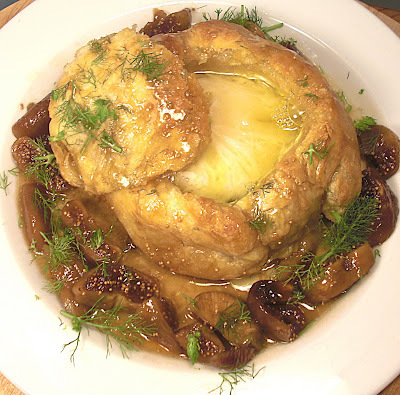 Ile de France brie baked in puff pastry with a whiskey fig compote and fennel. These flavors are so grown up its scary. I wrapped up the brie in puff pastry and baked it until it was golden. I simmered some figs in a little butter, whiskey and a touch of honey until it was as thick as grandmas accent and poured this all around the hot baked brie. I topped it off with some fennel fronds and dove in. Since 'william' is such a big fan I thought I would give 'william' another look. I have an incredibly low tolerance for being tolerant and once I cross over into that intolerant realm it is hard to get me out. I am, for the most part, an easy going kind of guy but if I get wronged or crossed then hell is a burnin' and nothing peeves me more than someone getting a dig in and then rescinding the dig as if it was all a big misunderstanding. Lawyers are well aware of this technique when in trials as they will often throw out an idea or concept only to have the other side object and then in some cases the judge will tell the jury to disregard it but it is too late, it has been said and it is in their heads and it was planned that way. Yup, we are one lucky bunch around here lately. "Why are you so lucky, Dogg" you might ask? We are lucky because we get to be inconvenienced by television. "Television, how does T.V. mess you up" you continue? T.V. screws up everything because they are shooting Law & Order on my block from yesterday until Friday. See, I am not happy. This means that all the cars on the block have to be moved or they get relocated. It means that if we come home or have to go to the store or anything while the cameras are rolling we have to wait like cattle. It means that late at night our block could be lit up like noon in July to create the daylight that has long since passed. It means that there could be unusually loud effects depending on the situation ranging from fires, to gun shots to car wrecks. While all of this might sound cool to some of you it is no longer cool to me. My block and my neighborhood is 'film shoot central' and it gets tiring after a while. Its the same thing as people with curly hair wanting straight hair. If you have it you dont want it. When life gives you film shoots then make lemonade or something like that. Amazing Tastes sent me some flavor packets some moons ago and I have been gradually using them to amazing results. The flavors are very concentrated so a heavy hand is cautioned against, trust me I found out the hard way. I little sprinke or two is all it takes. I made a syrup by rendering down a little of the tamarind and I rubbed this in with a little of the pork seasoning from Amazing Tastes, wrapped it up in banana leaves and foil and in the oven it went. I wrap up pork in banana leaves very, very often, it is a flavor that once you have had it once you will only want it in the future. The meat gets so tender and the taste....if you only knew. Here are a few things we have floating around over here at CheWhat that are in bad need of attention. King oyster mushrooms are often very available this time of year. These are small compared to the jumbo clubs that they can be. White and brown beech mushrooms are also pretty common throughout the spring. Tamarind. This has a few uses all of them secret, and it looks like I am not the only one. Gnocchi is about as easy as it gets but it is also so easy to do it wrong. Overwork the dough and they lose their softness, so gnocchi needs a light hand. I have made them this way, and that way and even another way, I like gnocchi. These little mounds of pillowy deliciousness are made with pea puree and potato. Make the gnocchi in the conventional way and serve with browned black truffle butter for out of this world, out of this worldness. I also jacked some up with white beech mushrooms and roma grape tomatoes. We had a birthday today. The little wolfster turned 11. You can look back on his last birthdays(april 21 the same as the queen of England and Tony Danza) and you will find 'theme' cakes. We are now at 'cake' and it makes me emotional. And I guess we had a cough. When I was a kid one of the most exotic things I had ever heard of was chicken Cordon Bleu, there were others too of course but chicken Cordon Bleu had French words in it and that appealed to my young mind. Well I made this often as a teenager and it impressed my family every time. I pounded out some chicken breasts put in a little ham and some swiss cheese, rolled it up, secured it with a toothpick, dredged it in flour, egg and then bread crumbs and proceeded to make a greasy mess all over the kitchen. The funny part to me now is that this dish, chicken Cordon Bleu, was probably invented by American chefs to imitate a French chicken dish called chicken Kiev. Cordon Bleu means 'blue ribbon' and in French culinary tradition, the Cordon Bleu is awarded to food or chefs of particularly high quality. So who cares? I always liked it and I always will. This is deconstructed chicken Cordon Bleu that is nothing like chicken Cordon Bleu in any way shape or form. I grilled a piece of chicken, I sauteed some mushrooms, I placed the grilled chicken on top of some room temperature brie and the sauteed mushrooms, I poured the pan drippings over the whole thing - I ate lunch. The brie melted into the woodsyness of the mushrooms and the pan drippings lit this baby on flavor fire. Tore up from the floor up. April is grilled cheese month. So if you are worth your salt then you have to make a grilled cheese. Who hasnt made some kind of grilled cheese in their life? I think it was one of the very first things I learned how to make when I was tall enough to reach the stove - butter the bread, put in cheese slices and toast on both sides. I grilled some baguette with brie and thin sliced apple. I used a mandoline so the slices were paper thin- well not paper thin more like cardboard thin I wanted them to still have some body. The sandwich came out great! The sweet soft crunch of the apple went so well with the creamy ooziness of the brie and it was all held up with the sturdy crust of the toasted baguette, definitely worth making over and over again, but I think my next one will be fig and brie. Confession time: I cant stop eating the truffle stuff and the last thing I needed to do was taste the truffle honey. It wont be long before I take my hard earned money and spend 60 bucks on a tiny little nugget of fresh truffle - I can see that on the horizon. 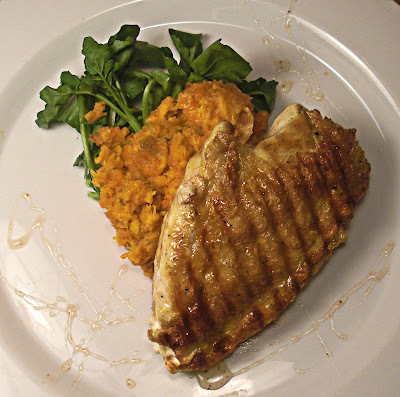 Pan grilled chicken breast seasoned with sea salt and olive oil over a bed of mashed sweet potatoes and watercress that is dressed with lime and salt - and once again some drizzles of truffle honey because it goes so well with everything! Ok busted, but I do have a Permit, bah dum dum. I finally got around to hookin' that baby up and I need to tell you - its good. The texture is firm the flavor is mild and, get this, citrusy, yeah you heard that right - this fish has a slight lemon tang to it that is very pleasant. I am glad I took the chance on this fish, it was unusual for the market and I rather doubt I will see it again, it tastes like chicken! Criss cross fish (I know I said I didnt want to grill it but I couldnt come up with anything better) a little sweet potato, a little pea puree, a drizzle swirl of acacia truffle honey and all hands have been dealt.